This article is about a city in Bulgaria. For other uses, see Pleven (disambiguation). Pleven (Bulgarian : Плевенpronounced [ˈplɛvɛn] ) is the seventh most populous city in Bulgaria. Located in the northern part of the country, it is the administrative centre of Pleven Province, as well as of the subordinate Pleven municipality. It is the biggest economic center in Northwestern Bulgaria. At the end of 2015 its population is 99,628. Pleven Province is a province located in central northern Bulgaria, bordering the Danube river, Romania and the Bulgarian provinces of Vratsa, Veliko Tarnovo and Lovech. It is divided into 11 subdivisions, called municipalities, that embrace a territory of 4,333.54 km² with a population, as of February 2011, of 269 752 inhabitants. The province's capital is the city of Pleven. The name comes from the Slavic word plevnya ("barn") or from plevel, meaning "weed", sharing the same root, and the Slavic suffix -en. In linguistics, a suffix is an affix which is placed after the stem of a word. Common examples are case ending, which indicate the grammatical cased of nouns or adjectives, and verb endings, which form the conjugation of verbs. Pleven is in an agricultural region in the middle of the Danubian Plain, the historical region of Moesia, surrounded by low limestone hills, the Pleven Heights. The city's central location in Northern Bulgaria defines its importance as a big administrative, economic, political, cultural and transport centre. Pleven is 170 kilometres (106 miles) away from the capital city of Sofia, 320 km (199 miles) west of the Bulgarian Black Sea Coast and 50 km (31 miles) south of the Danube. The Danubian Plain constitutes the northern part of Bulgaria, situated north of the Balkan Mountains and south of the Danube. Its western border is the Timok River and to the east it borders the Black Sea. The plain has an area of 31,523 square kilometres (12,171 sq mi). It is about 500 kilometres (310 mi) long and 20 to 120 kilometres wide. The Vit also Vid is a river in central northern Bulgaria with a length of 168 km. It is a tributary of Danube. The source of the Vit is in Stara Planina, below Vezhen Peak at an altitude of 2,030 m, and it empties into the Danube close to Somovit. The river has a watershed area of 3,228 km², its main tributaries being Kamenska reka, Kalnik and Tuchenitsa. Pleven's climate is temperate continental. Winters are cool, with much snow: temperatures usually fall below −20 °C (−4 °F) overnight. Springs are warm, with temperatures around 20 °C (68 °F). Summers are warm, and temperatures have exceeded 38–44 °C (100–111 °F) on occasion. The average annual temperature is around 13 °C (55.4 °F). The 5th millennium BC spanned the years 5000 through 4001 BC. It saw the spread of agriculture from Western Asia throughout Southern and Central Europe. On the other hand, the Siege of Plevna stands out among other countless sieges and military actions in the region because of its significance. Without this fortress slowing the Russian onslaught, which gave the Great Powers time to intercede, Constantinople would have been repossessed by a Christian army once more. According to census 2011, Pleven has a population of 106,954 inhabitants as of February 2011. The ethnic breakdown is 97% Bulgarians among others. The number of the residents of the city reached its peak in the period 1988-1991 when exceeded 135,000. The following table presents the change of the population after 1887. Population 14,307 23,049 31,520 39,059 57,555 78,933 107,883 129,863 130,747 121,880 113,700 111,426 106,954 ?? Pleven has three Eastern Orthodox churches, the Bulgarian National Revival St Nicholas Church (1834) that was constructed at the place of a chapel from the Second Bulgarian Empire, the St Paraskeva Church (1934) and the Holy Trinity Church, built in 1870 at the place of a church mentioned as early as 1523 and inaugurated by Exarch Antim I. As of 2005 [update] , a new Eastern Orthodox church is being built in the Strogoziya quarter. The most important economic sectors in Pleven are chemical, textiles and foodstuffs industries, the manufacturing of cement and glass, machine building, tailoring, agriculture, retail and services. The city has seen a number of major foreign investments in the late 1990s and early 2000s. Particularly noticeable is the mass construction of hypermarkets, with two Billa, two Kaufland, two Carrefour (in construction- first one to open in MALL PLEVEN in 2011), DM, Plus (in construction), ELEMAG, METRO, one LIDL store, a Praktiker, bauMax and a number of other hypermarkets being opened as of 2006 [update] . The Pleven City Center and central mall pleven mall was opened in 2008. The Ivan Radoev Dramatic Theatre is the centre of theatrical life in Pleven. A number of community centres ( chitalishta ) are also active in the city. Pleven is often regarded [ according to whom? ] as an important centre of sports in Bulgaria, with many noted Bulgarian sportspeople having been born and/or trained in the town, including Tereza Marinova and Galabin Boevski. Silistra is a port city in northeastern Bulgaria. The city lies on the southern bank of the lower Danube river, and is also the part of the Romanian border where it stops following the Danube. Silistra is the administrative center of the Silistra Province and one of the important cities of the historical region of Southern Dobruja. Oltenița is a city in Romania in the Călărași County on the left bank of the Argeş River where its waters flows into the Danube. Nikopol is a town in northern Bulgaria, the administrative center of Nikopol municipality, part of Pleven Province, on the right bank of the Danube river, 4 kilometres downstream from the mouth of the Osam river. It spreads at the foot of steep chalk cliffs along the Danube and up a narrow valley. As of December 2009, the town has a population of 3,892 inhabitants. Lovech is a city in north-central Bulgaria. It is the administrative centre of the Lovech Province and of the subordinate Lovech Municipality. The city is located about 150 kilometres northeast from the capital city of Sofia. Near Lovech are the towns of Pleven, Troyan and Teteven. Osman Nuri Pasha, also known as Gazi Osman Pasha, was an Ottoman field marshal and the hero of the Siege of Plevna in 1877. Although unsuccessful in defending the city, he was awarded the title Gazi for gallantry in holding the city for five months against superior Russo-Romanian forces. In addition to his Adjutancy title, Osman received the Order of the Medjidie and the Imtiyaz Medal for his services to the Empire. He was made Marshal of the Palace by the Sultan and the Ottoman military anthem called Plevna March was composed for his achievements. The Istanbul suburb of Taşlıtarla was renamed Gaziosmanpaşa in his honour. Shumen is the tenth largest city in Bulgaria and the administrative and economic capital of Shumen Province. Pleven is a major town in Northern Bulgaria, capital of the Pleven Province. Knezha is a town in Pleven Province, Northern Bulgaria. It is the administrative center of the homonymous Knezha Municipality. As of December 2009, the town has a population of 11,191 inhabitants. Skobelev Park is a museum park in the vicinity of Pleven, Bulgaria. It was built between 1904 and 1907 on the very battlefield of the Siege of Plevna during the Russo-Turkish War of 1877-78, specifically the third assault of General Mikhail Skobelev's detachment between 30 August and 11 September 1877. Grivitsa is a village in Pleven Municipality, Pleven Province, central northern Bulgaria. It is primarily known as the site of one of the key engagements in the Siege of Plevna during the Russo-Turkish War of 1877–1878. 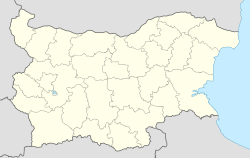 Pordim is a town in Pleven Province in central northern Bulgaria and the administrative centre of Pordim Municipality. The town is 155 metres above sea level in the Danubian Plain. In December 2009 the population was 2,117. ↑ "Stringmeteo – Pleven Climate". Stringmeteo. 2011. Retrieved June 20, 2012. ↑ Crowe, John Henry Verinder (1911). "Plevna § Investment and Fall of Plevna" . In Chisholm, Hugh. Encyclopædia Britannica . 21 (11th ed.). Cambridge University Press. p. 840. ↑ "District Pleven | National statistical institute". www.nsi.bg. Retrieved 2017-12-26. ↑ "EURES - Labour market information - Pleven - European Commission". ec.europa.eu. ↑ "Predavatel • Радио и телевизия в Плевен, Radio & Television in Pleven". www.predavatel.com. Retrieved 18 October 2008. ↑ www.davidkidd.net/20Plevna.html Archived 17 September 2007 at the Wayback Machine . "Община Плевен" (in Bulgarian). Retrieved 22 December 2006. Wikimedia Commons has media related to Pleven . Wikivoyage has a travel guide for Pleven .